How to maintain state and provide functionality to class instances using variables and methods. When you create an object by instantiating a class, that object will have its own state and functionality. Its state is determined by all the values of its instance variables, which are unique to that object. Its functionality will be determined by the instance methods that are specified in its class blueprint. In this lesson, we'll look at how these instance variables and methods are created, accessed, and used to bring your classes to life. In the following lesson, we'll zoom out a bit and focus on the class variables and methods, which provide a more general functionality for a given class. This stuff is bread and butter OOP, so make sure you're able to understand it. Build a conceptual model and ask for help if you need it! We've talked about how instances of classes (ie. objects) share their methods (and will cover it in detail below), but what about the variables representing their attributes? You don't want all your Vikings to have the same strength, so we use instance variables to take care of that. That allows the Viking Sven to have a different @health value than Oleg. You designate an instance variable using the @variable_name notation, and you'll be able to use it the same way for every instance of Viking but it will have a unique value for each. These instance variables are part of setting up your object's state. When your instance is destroyed, you lose access to its instance variables as well. So what was that random string in the Terminal output <Viking:0x007fc20b9bcec0 ...>? That's the position in the computer's memory that the viking object is stored. We already learned how objects are really just references to places in memory, and this helps illustrate that as well. Instead of passing in four explicit variables, a common pattern is to pass in a single hash instead (where the attributes can be declared in any order) and then just unpack it inside your initialize class. You'll see this used by all kinds of methods in Rails, not just for instantiating new classes. If you want your Viking to be able to do anything, you need to give it some methods. Since these methods get called on an individual instance of the Viking class, they're called Instance Methods. Some examples of instance methods that you've already seen include your old friends each and sort and max etc. We just usually don't call those other ones "instance" methods so maybe it wasn't obvious but they all get called on instances of Arrays. Now, if I had two Vikings, oleg and lars, I could say > lars.attack(oleg). Woah! The instance variables are a part of oleg but you can't access them from outside him because it's really nobody's business but his. Ruby prevents you from viewing the instance variables of an object unless you're explicitly allowed to. That was easy! You can consider the "Getter" method to be a tunnel into the object's otherwise hidden core. It may feel a bit weird at first to think of health= as a different method from health but it is. In this case, we've again tunneled into our object but now we're actually messing around with things inside of it. There's nothing magical at all about Getters and Setters -- they're just a pattern that's become standard practice in the OOP world to selectively expose parts of objects. They are therefore an important concept to understand. Think of an instance of your class as a completely sealed bunker. No one from the outside can see in or make it do anything. It doesn't matter if that instance is a Viking warrior or a Dog or a blog Post -- it's sealed to the outside world until you start giving it functionality via methods. You let the outside world interact with your class by adding instance methods. If you add a walk_forward method to your Viking, it opens up a little window into that instance so now other people can tell it to walk_forward (but that's it!). Each method that you give it (which isn't explicitly marked private) opens up a tiny little interface for you to use that method on the instance. If you want to know about the instance's state, you presumably want to access its instance variables. These are also hidden from you. You don't know your Dog's age or your Post's body. To give the outside world the ability to view these things, you need to expose them (open up the little window) with an instance method. In this case, you create a publicly-available method which does nothing except return that particular instance variable. That's all a "getter" is -- just a simple method which opens up a little interface so you can access an instance variable. Setters are the same idea -- since the outside world isn't allowed to mess around with your Dog's instance variables, they need to do so via an instance method which opens up the window. Instead of a method which simply returns the instance variable like a "getter", this method needs to actually modify that variable. Well, you can imagine that you'll probably be writing a whole lot of getters and setters, so Ruby gives you a helper method called attr_accessor. attr_accessor isn't magical, it just uses Ruby's ability to create methods from within your script (part of "metaprogramming") to set up name and name=(new_name) and age and age=(new_age) etc. You shouldn't make anything readable and certainly not writeable without a good reason. If you only want one or the other, Ruby gives you the specific attr_reader (for getters) and attr_writer (for setters). They should be pretty self explanatory. attr_reader and attr_writer for the same attribute is the same thing as using attr_accessor. It's good to only show what's absolutely necessary. That way you keep your class's interface as need-to-know as possible. This should be familiar from our discussions on creating good modular systems. Calling it normally using @age. Calling the getter or setter method on the instance using self. Interestingly enough, the self is actually optional because Ruby assumes if you just type shout("OUCH!") that you're trying to run the method shout on the self. When you do this, Ruby goes on a scavenger hunt to see if the shout method or a variable called shout exists on the self object and then runs what it finds. Hopefully you've got a solid understanding of how a class instance achieves its state and functionality now. 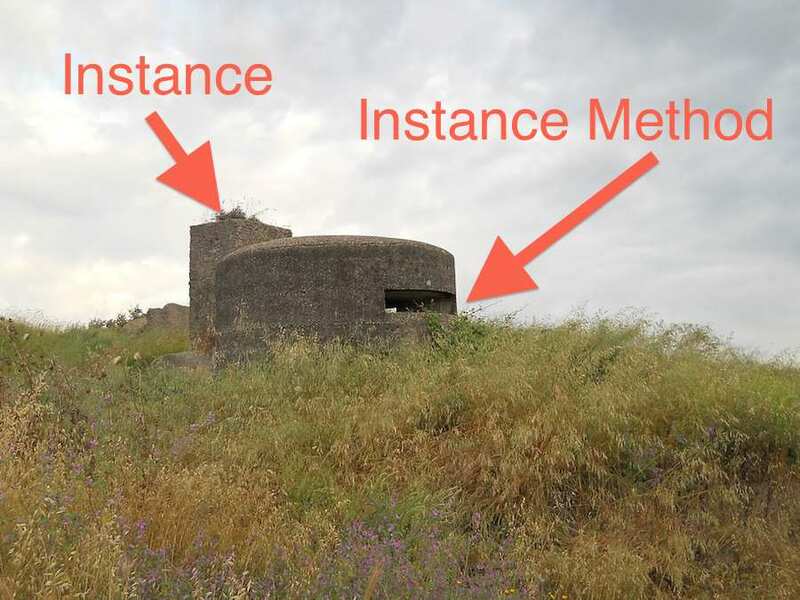 Just stick with the bunker analogy -- that nothing is accessible from outside an instance except its methods -- and you'll be fine. In the next lesson, we'll zoom out to look at class-wide behaviors. In general, most of your objects will get their state and functionality from instance variables and methods. Sometimes, though, it makes sense to offload certain generic or shared elements to the class itself by using class variables and methods. You'll learn all about that next.